Passport/Visa Requirements: All visitors need a passport valid for at least three months beyond the date you intend to leave the country. Time Zone: 12 hours ahead of Greenwich Mean Time. Daylight Saving Time is observed from the first Sunday in October to the third Sunday in March. Even the most jaded of travelers can’t fail to be impressed by New Zealand. With its magnificent fiords and glaciers, dense rainforests, brooding volcanoes, tumbling rivers, sandy beaches, and picturesque farms, it's as if the most scenic parts of Europe and Patagonia were flavored with a hint of Polynesia and packed into a country the size of Colorado. How exceptional is it? For the Lord of the Rings trilogy, New Zealand stood in for the wooded glens of Rivendell, the towering, snow-capped Misty Mountains, the stark, moody expanse of Mordor, and the rolling green hills of the Shire – the characters and buildings may have needed CGI, but not the landscapes. Such a variety of terrain means a huge range of outdoor activities to choose from: sailing, rafting, kayaking, hiking (or tramping, as the Kiwis call it), fishing, wildlife expeditions, fiord cruises, and scenic flights, just to name a few. If you have active kids, there are few better destinations. My family visited New Zealand some years ago, when my kids were still fairly young, and spent most of our time in the North Island. We were there while the America’s Cup was being hosted in Auckland. In keeping with the sailing theme, we rented an amazing house in the subtropical Bay of Islands, which are a great place to sail. Because of New Zealand’s rugged terrain, the best way to get around it is by air – we took a helicopter from Auckland, flying over the majestic mountains and glaciers, along the coastline and over the massive sand dunes to Cape Palliser, where the Tasman Sea meets the Pacific Ocean, and finally to the historic town of Russell, where we landed in the backyard of the house (called the Eagle’s Nest). 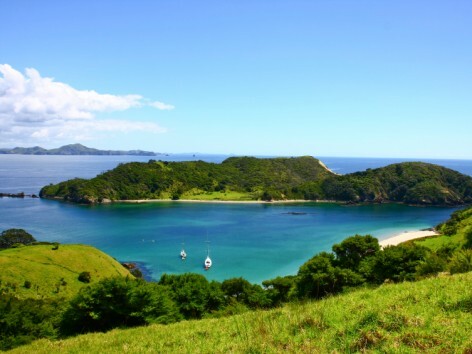 The Bay of Islands features some 150 pristine islands with deserted beaches – sailing between them, following pods of dolphins or whales, makes for an unforgettable afternoon. Next, we headed to Lake Taupo, one of the largest lakes in the Southern Hemisphere, and stayed at legendary Huka Lodge, overlooking Huka Falls. The lodge is a New Zealand icon – we met a very interesting mix of people during the pre-dinner cocktail hours. Our days were spent trout fishing on the lake, and fly-fishing on private properties in the surrounding wilderness. It was truly idyllic. When we go back, we will want to explore the wonders of the South Island – the rainforests, hanging valleys and waterfalls of Milford Sound, the snowy peaks and glacial lakes of the Southern Alps, the celebrated vineyards of Marlborough, and the thrills of Queenstown, “Adventure Capital” of New Zealand. We’ll delve into Maori culture with a kapa haka dance performance or a traditional Maori feast. And we’ll see the places where the new Hobbit trilogy is being filmed. Wherever we go, we’ll enjoy New Zealand’s famous hospitality – they’re some of the friendliest people around, and their luxury accommodations are second to none.